The coinages of the Chinese neighboring countries had been strongly influenced by the Chinese system since Tang Dynasty. These countries cast their own round coins, with a square hole in the center. As the development of the international commercial economy, that kinds of foreign copper cash occasionally flowed into China too. 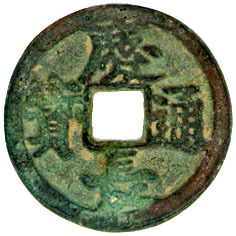 From eighteenth century, plenty of the Annames, Japanese and Korean copper coins bore legends in Chinese character were smuggled into China and circulated in mixed strings in the market. I post below item is a typical example of its kind. I am very lucky to meet this cash after almost four centuries as it was cast. 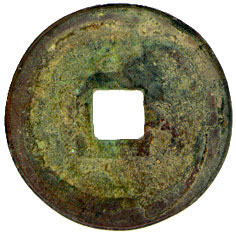 In fact, it is difficult to get a Japanese cash cast before 1626 in Hong Kong. I enjoy it with not only its monetary value, but also its background history and cultures it portrays. For the inscription of this cash, I don't agree with Fredrik Schjoth, he stated in his book that "the two characters tsu-ho (t'ung pao) are of the Ming style of writing, while the Kei-cho (Ch'ing Ch'ang) have been added independently and fit in awkwardly."